Mad Professor Golden Cello Give Away – And the winner is…. Home » Contest » Mad Professor Golden Cello Give Away – And the winner is…. We would first like to thank every in participating with PedalFinder.com‘s launch. We wanted to create an application that would be fun and useful to use, and by the overwhelming response from musicians everywhere, I think we hit the mark. For the site to be successful, reviews from players was crucial. Reviews not only provide general experience with a pedal, but also provides the information that separates our site from others – the ability to search on genres, styles, equipment, etc. So again, thank you so much for helping with that!! This current give away was for the Mad Professor Golden Cello. This is a two in one pedal. It’s a great sounding overdrive with a very simple delay. Want a great lead tone with trailing delays? Awesome. 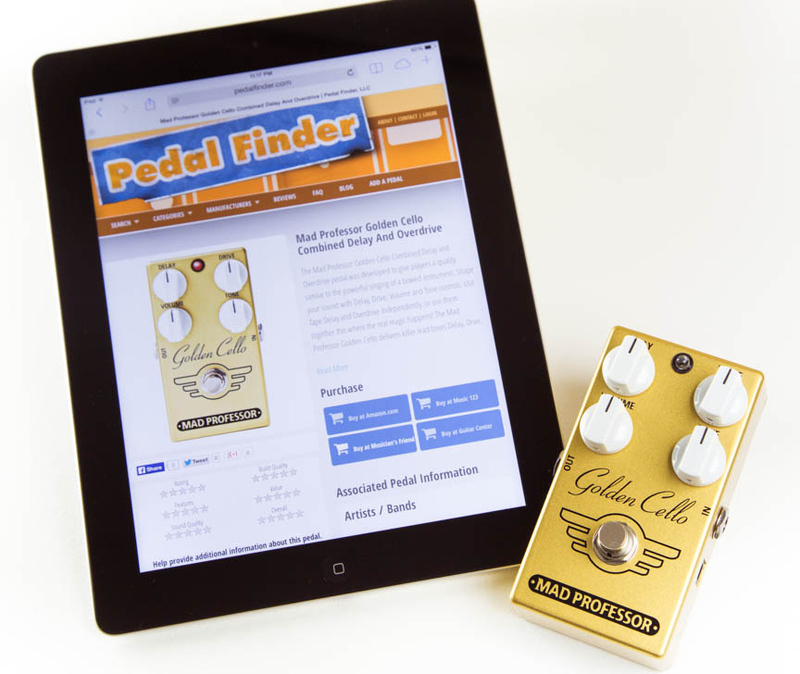 The Golden Cello normally retails for $150, so this is a great deal for a lucky Pedal Finder user! We received a massive amount of contributor entries for this give away, but as they say.. “there can only be one”. The winner of the Mad Professor Golden Cello Give Away is Ron G. of Chittenden, VT. Congrats Ron, we’ll be shipping out the pedal tomorrow with a few extra goodies! For those of you that did not win, we will be providing more and more give aways in the very near future. Please be sure to check back often!!! Congrats to winner and thand Pedalfinder for fun & competition!